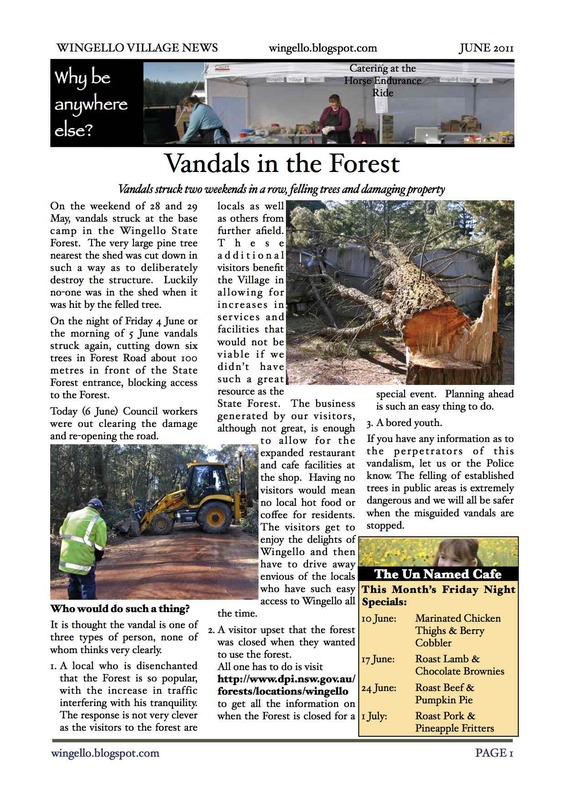 On the weekend of 28 and 29 May, vandals struck at the base camp in the Wingello State Forest. The very large pine tree nearest the shed was cut down in such a way as to deliberately destroy the structure. Luckily no-one was in the shed when it was hit by the felled tree. On the night of Friday 4 June or the morning of 5 June vandals struck again, cutting down six trees in Forest Road about 100 metres in front of the State Forest entrance, blocking access to the Forest. Today (6 June) Council workers were out clearing the damage and re-opening the road. It is thought the vandal is one of three types of person, none of whom thinks very clearly. A local who is disenchanted that the Forest is so popular, with the increase in traffic interfering with his tranquility. The response is not very clever as the visitors to the forest are locals as well as others from further afield. These additional visitors benefit the Village in allowing for increases in services and facilities that would not be viable if we didn’t have such a great resource as the State Forest. The business generated by our visitors, although not great, is enough to allow for the expanded restaurant and cafe facilities at the shop. Having no visitors would mean no local hot food or coffee for residents. The visitors get to enjoy the delights of Wingello and then have to drive away envious of the locals who have such easy access to Wingello all the time. A visitor upset that the forest was closed when they wanted to use the forest. All one has to do is visit http://www.dpi.nsw.gov.au/forests/locations/wingello to get all the information on when the Forest is closed for a special event. Planning ahead is such an easy thing to do. If you have any information as to the perpetrators of this vandalism, let us or the Police know. The felling of established trees in public areas is extremely dangerous and we will all be safer when the misguided vandals are stopped. The Southern Highlands Horse Endurance Ride was a great success with 172 riders taking part in a 20km, 40km, 80km or 100km ride. The new base camp situated on private property worked extremely well, providing a very communal atmosphere. It seemed as if a little village appeared on the Friday evening and Saturday morning, hustled and bustled with activity and good cheer for the two days and then quickly disappeared by Sunday evening! Once more the Wingello Village Store was a Minor Major Sponsor and this year we also provided on-site catering. By the end of the two days we had provided over 270 burgers! Consider that if you piled all these one on top of another, this would make a tower of yummy food 10 metres high! Next year Wingello will be host to the State championships of the Horse Endurance Rides. One of our Wingello residents has won a 2011 Logie for the Most Outstanding Factual Program. Ben Ulm won the Logie for his documentary Trishna & Krishna: The Quest for Separate Lives. The film follows the two conjoined twins from Bangladesh whose amazing separation captured the imagination of the country. This is the incredible true story of tiny conjoined twins Trishna and Krishna, abandoned just after birth at an orphanage in Bangladesh. They were joined at the back of the head and shared blood vessels between their brains. Fireflies Golf Day was a Success! The Wingello Rural Fire Brigade’s annual golf day went extremely well. Over 80 golfers enjoyed themselves playing golf. The meals provided by the Moss Vale Golf Club were excellent. Not only is the annual golf day an important source of funds for the Brigade, it is also a very enjoyable way to be part of the community. Following the success of the inaugural Wingello Community dinner, we will be having the next one on 10 June. Make a booking to be part of the meal and great company. $22 a head gets you the three course meal, probably in front of the fireplace on a chilly evening. BYO wine to share in the conviviality! On 22 July we will be having a Christmas in July celebration as the community meal. Same price, same deal, all with a Christmas theme - without the presents and Midnight Mass, but probably with chilly Winter weather Northern climates are used to at Christmas time. 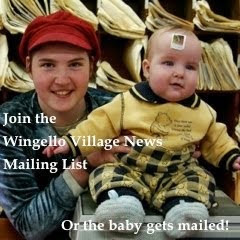 Wingello Village News for June 2011 is out.